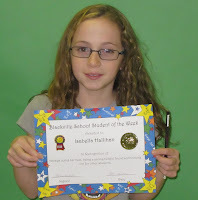 Isabella Hallihan of grade 5H was selected Student of the Week for October 22-26. Isabella always does her best and is a caring and helpful friend. She looks out for other students too.